Consultants will survey existing pier facilities on Portland Harbor and assess potential demand from a booming aquaculture industry. SOUTH PORTLAND — There are 50 experimental or limited-purpose aquaculture sites within 10 miles of the city-owned Portland Street Pier. Maine’s aquaculture industry is booming, experts say, and some city officials see a business development opportunity for the long-neglected municipal pier as farming of mussels, oysters and other ocean produce increases in nutrient-rich Casco Bay. 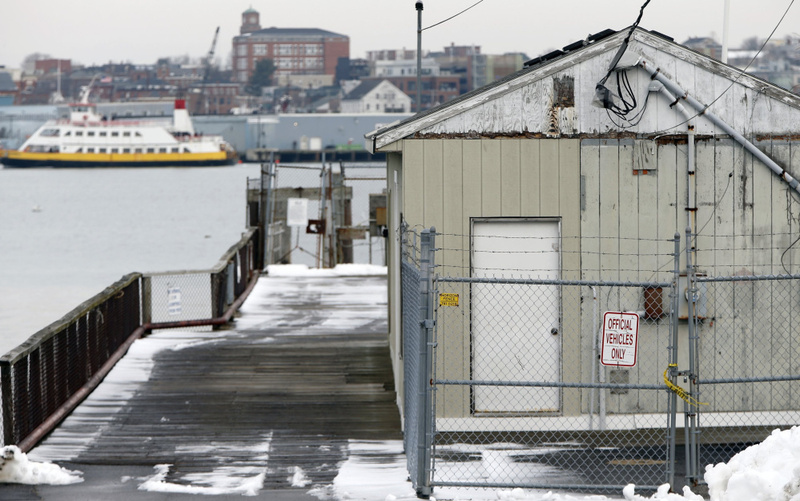 But before the city invests $50,000 to fix up the pier – let alone as much as $2 million to fully redevelop and expand it – a feasibility study is being done to gauge interest in and need for improved access on South Portland’s working waterfront. The city is working with the Gulf of Maine Research Institute, winning a $30,000 harbor planning grant last summer from the federally funded Maine Coastal Program to work up a redevelopment plan for the municipal pier. With that money, the city recently hired GEI Consultants, an engineering and environmental firm, to do a site assessment, conceptual design and feasibility analysis. A preliminary report identified six state-licensed commercial aquaculture leases within 10 miles of the pier, in addition to the 50 experimental or limited-purpose aquaculture sites. The resulting pier master plan, including a needs assessment for aquaculture and fisheries by the Gulf of Maine Research Institute, is expected to be completed in June. But long before that’s done, City Councilor Claude Morgan has no doubt there would be great demand for an updated and expanded Portland Street Pier, which is located in his district. Morgan represents the city on the Portland Harbor Waterfront Alliance. The city has owned the Portland Street Pier since the late 1800s. It’s located off Front Street in the Ferry Village neighborhood, wedged among the Sunset Marina, the Saltwater Grille restaurant and a couple of massive green fuel tanks owned by the Portland Pipe Line Corp.
It’s currently operated as a seasonal fishing pier, with 11 of 15 slips leased from April through November for $1,250 per year, mostly to lobstermen and other small fishing boats. It includes a modest wood-frame building that’s available for lease and primarily used for storage. The entire pier facility generates about $20,000 in revenue annually, which limits how much the city is willing to spend on maintenance and improvements, especially given limited parking, seasonal use and the need to dredge the site. “We’re basically subsidizing an industry that’s already well-represented in the infrastructure that’s available on the harbor,” Morgan said. Redevelopment of the pier would include adding floats to accommodate more boats, installing equipment to assist in unloading and temporarily storing ocean produce, and dredging to allow safe, year-round use of the facility. Morgan agrees, however, that the city needs proof of potential before it invests taxpayer dollars or seeks additional grant funding for a pier project. The needs assessment by the Gulf of Maine Research Institute will include a survey of existing pier facilities on Portland Harbor and an outline of future tenant needs that the Portland Street Pier might fulfill, said Reny, the assistant city manager. “We hope to hear from anybody interested in the project and in the future use of the pier,” Reny said. Reny can be reached at [email protected] or 767-7606.